Arunachal Pradesh Cricket team beat Mizoram by 11 runs, Md Bilal scored the highest 110 . 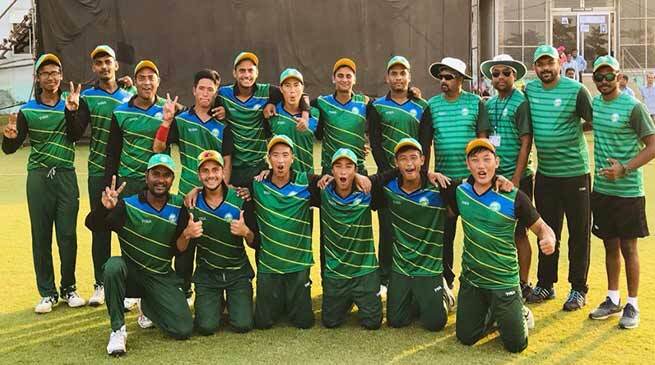 Arunachal Pradesh U-19 Cricket team defeated Mizoram by 11 runs in their first match of the ongoing Vinoo Mankad Trophy played at Odisha on Friday. After winning the toss Arunachal decided to bat first and scored 209 in 50 overs. Md Bilal scored the highest 110 while Varun Singhal and Hardik scored 18 and 14 runs respectively. For Mizoram Nunfela took 3 while V L Remruata, Tluanga and Sahil took one wicket each. Chasing the target Mizoram scored 198/7 in 50 overs. Shubham Yadav ,Lalhriatrenga scored 68 and 51 runs for the loosing team. Govind Mittal took 3 wicket while Neelam Josaph, D Bagra and Hardik took 1 wicket each for the state. Arunachal will play their next match on October 7 against Sikkim.